Probashbangla24 online Desk : A mass grave containing 75 bodies has been found near the former jihadist bastion of Sirte in western Libya, an official said Wednesday. Mohamad al-Amial, the coastal city’s municipal council spokesman, told AFP the mass grave was uncovered in an agricultural area of Al-Daheir, west of Sirte. 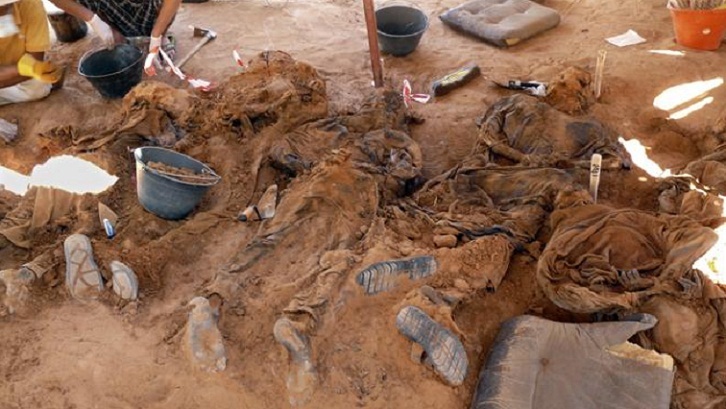 “Seventy-five decomposed bodies were recovered” in the presence of the public prosecutor, Sirte’s security force and the Red Crescent, he said. Amial said the find was made “a few days ago” and that the bodies were believed to be of Islamic State (IS) group members, although there was no confirmation. IS jihadists overran Sirte, 600 kilometres (375 miles) east of Tripoli, in June 2015. Forces of Libya’s UN-backed unity government expelled IS from the coastal city in December 2016 after eight months of deadly combat. The group has since pulled back to desert outposts. It claimed responsibility for a suicide attack last month on the Tripoli headquarters of Libya’s National Oil Corporation that killed two staffers as well as an assault in May on the country’s electoral commission in which 14 people died. IS took advantage of the anarchy in Libya after the NATO-backed overthrow and killing of longtime dictator Moamer al-Kadhafi in 2011 to establish footholds in several parts of the country.